We're excited to share with you the first release of the CalReply dashboard. Designed for broadcasters, sporting organisations and social media managers, the CalReply dashboard offers a full calendar management solution via an easy to use web app. Within the CalReply dashboard you can create, update and publish calendar changes with a few clicks. One of the slickest features of the dashboard is the CalReply calendar editor where you can style calendars, and make them look amazing without having to write any code. The dashboard presents a view of the existing and draft calendars with a subscriber count summary. With the click of a button a new calendar can be created or an existing calendar can be managed. This is where it all begins. Give your calendar a name, a short code and upload a logo. 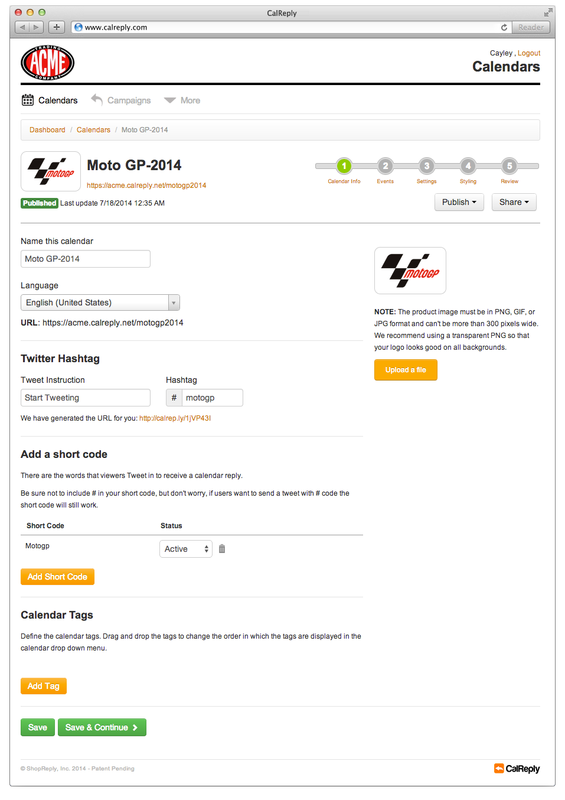 Short codes represent words that fans can Tweet to your Twitter handle in order to receive a calendar reply. For example, if you wanted your calendar to reply to the hashtag #schedule you would add a short code of the word schedule. Short codes start working immediately. Tags are used to group common events. A good use of tags are team names. Lets say you want to create a calendar for a sporting league where viewers can choose between adding all games, or the games of their favourite teams such as the Chicago Bulls and New York Knicks. When you create events for your calendar, you can assign a tag to each event, so the Chicago Bulls event would be tagged with 'Chicago Bulls' and 'All Teams', and New York Knicks event would be tagged with 'New York Knicks' and 'All Teams'. If a calendar has tags, a drop down menu containing these tags will appear on the calendar page. Creating events is a piece of cake. Creating an event involves specifying an event name, location, date and time and events can be set to recur as required. 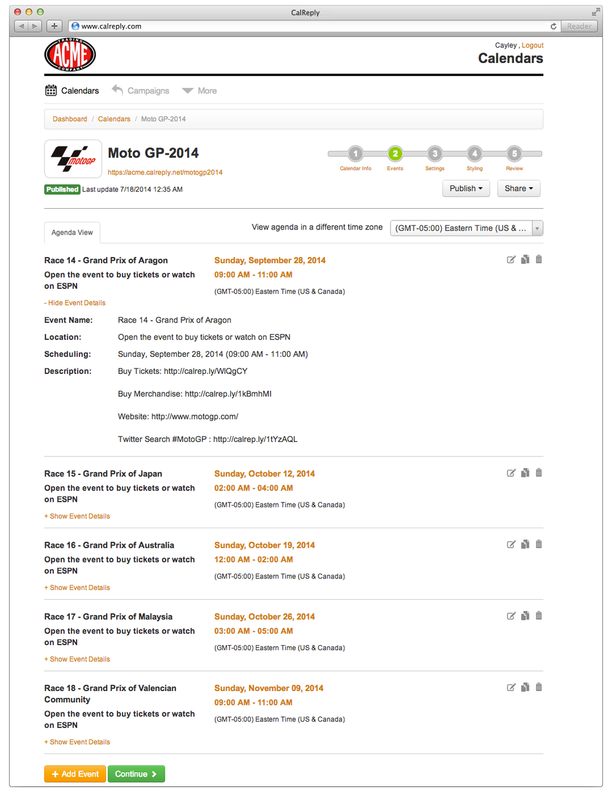 Any changes made to an event can be published to subscribers in real-time by selecting Publish from the publish menu. This is the automated reply Tweet that is sent out from your Twitter account in reply to anyone that mentions your Twitter handle, along with a valid short code in a Tweet. Usually it says something like Add every episode to your mobile calendar - calrep.ly/xyz where the URL links to your CalReply calendar page. You can embed HTML in the header and footer tags of your calendar page. Common usages include retargeting and analytics tracking pixels. You can choose to prompt users to enter their email address before subscribing to a calendar. By entering your Google Analytics tracking code we'll make sure all calendar traffic can be viewed in your own Google account. Twitter Cards enable you to embed rich content on your Twitter reply message. Currently we support Twitter Photo cards. You can learn about Twitter Photo cards here. When you select Styling, you can create amazing looking calendars quickly and easily with the CalReply calendar editor. The calendar editor also provides a real-time preview of what your calendar looks like. Gain a birds-eye view of your calendar, your events and gain insights into how your calendar is performing. The review step provides you with a overview of your calendar settings, short codes and subscriber performance including a graph that illustrates subscribers received over time.